Description: The Mistletoe was a symbol of love and friendship in Norse mythology, which is where the practice of kissing under the precious holiday plant originated. 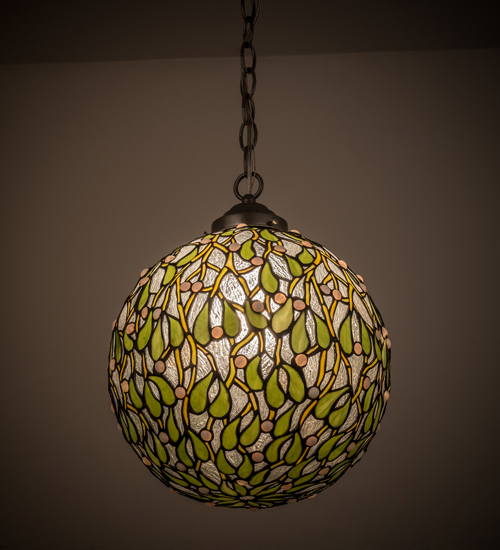 Reminiscent of Mistletoe ornaments suspended in churches and doorways, this beautiful art glass globe is adorned with vibrant Green leaves and White Jewel Berries on a Clear ripple glass background. The hardware is featured in a Nickel finish. Custom options available including special sizes, colors and finishes, and dimmable energy efficient lamping options. The pendant is UL and cUL listed for damp and dry locations.